UNCASVILLE, CONN. – May 22, 2018 – Some of the best classic American muscle cars will flex their muscles during the 3rd Annual Barrett-Jackson Northeast Auction, June 20-23, 2018, at Mohegan Sun in Connecticut. Among the most anticipated models of this year’s Barrett-Jackson Northeast auction include a professionally restored ’70 Chevelle SS454 LS6 (Lot #670) and ’70 Plymouth Road Runner Superbird (preview). Two professionally restored and highly coveted American muscle cars crossing the block include a ’70 Chevelle SS454 LS6 (Lot #670), which scored a perfect 1,000 at the Eckler’s Chevy Classics Club Winter National in 2013. With over 3,300 man-hours of restoration work invested, this award-winning Chevelle is powered by a 454ci engine mated to a Turbo 400 automatic transmission. 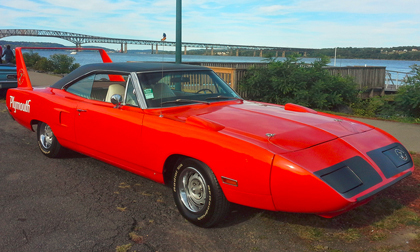 With only 3,500 miles since its professional restoration, a ’70 Plymouth Road Runner Superbird (preview) is a rare find that features a date-code-correct V-Code 440ci engine mated to its original transmission. Barrett-Jackson’s 2018 Northeast Auction is June 20-23, 2018, and will be the first event inside Mohegan Sun’s new 125,000-square-foot Expo Center. The preview docket is now available; for information on becoming a bidder, go to www.Barrett-Jackson.com/bid. To submit an application to consign at the 2018 Northeast Auction, click here. Also, follow Barrett-Jackson on Facebook, Instagram, LinkedIn and Twitter for the latest news and information heading into the 2018 Northeast Auction.